You often hear me harping on the dangers of too much debt, and I keep my eyes peeled for significant work that backs up my concerns. In today’s Outside the Box good friend Dr. Lacy Hunt of Hoisington Investment Management gives us more ammunition to take on those who just don’t seem to get that the endless piling up of debt is not a sustainable way to run an economy. Delinquencies in household debt moved higher even as financial institutions continued to offer aggressive terms to consumers, implying falling credit standards. Furthermore, the New York Fed said subprime auto loans reached the greatest percentage of total auto loans in ten years. Moreover, they indicated that the delinquency rate rose significantly. 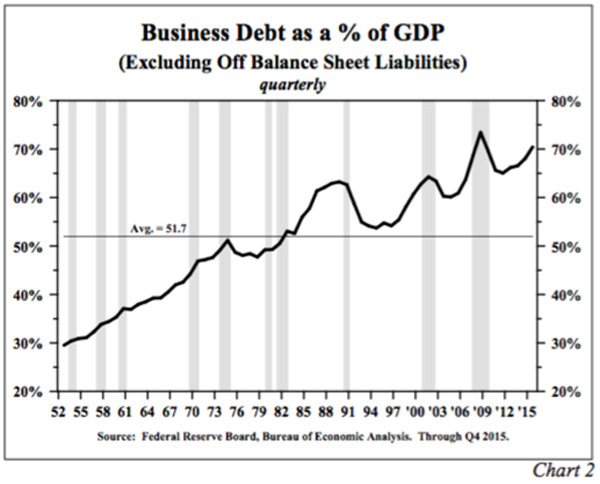 Last year business debt, excluding off balance sheet liabilities, rose $793 billion, while total gross private domestic investment (which includes fixed and inventory investment) rose only $93 billion. Thus, by inference this debt increase went into share buybacks, dividend increases and other financial endeavors…. When business debt is allocated to financial operations, it does not generate an income stream to meet interest and repayment requirements. Such a usage of debt does not support economic growth, employment, higher paying jobs or productivity growth. Thus, the economy is likely to be weakened by the increase of business debt over the past five years. 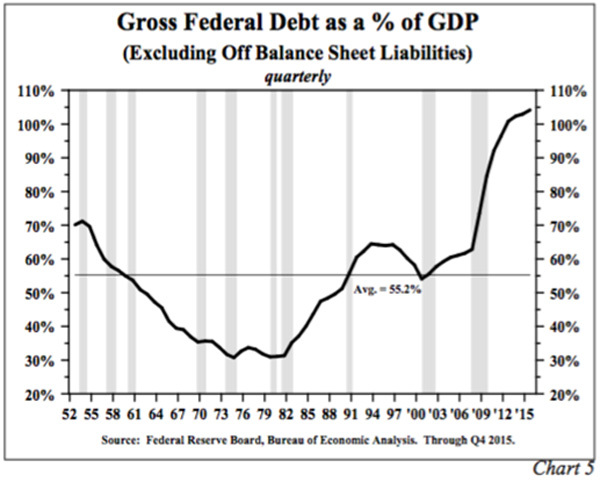 U.S. government gross debt, excluding off balance sheet items, gained $780.7 billion in 2015 or about $230 billion more than the rise in GDP…. The divergence between the budget deficit and debt in 2015 is a portent of things to come. This subject is directly addressed in the 2012 book The Clash of Generations, published by MIT Press, authored by Laurence Kotlikoff and Scott Burns. They calculate that on a net present value basis the U.S. government faces liabilities for Social Security and other entitlement programs that exceed the funds in the various trust funds by $60 trillion. This sum is more than three times greater than the current level of GDP. State and local governments … face adverse demographics that will drain underfunded pension plans…. The state and local governments do not have the borrowing capacity of the federal government. Hence, pension obligations will need to be covered at least partially by increased taxes, cuts in pension benefits or reductions in other expenditures. Total debt … increased by $1.968 trillion last year. This is $1.4 trillion more than the gain in nominal GDP. The ratio of total debt-to-GDP closed the year at 370%, well above the 250-300% level at which academic studies suggest debt begins to slow economic activity. The Federal Reserve, the European Central Bank, the Bank of Japan and the People’s Bank of China have been unable to gain traction with their monetary policies…. Excluding off balance sheet liabilities, at year-end the ratio of total public and private debt relative to GDP stood at 350%, 370%, 457% and 615%, for China, the United States, the Eurocurrency zone, and Japan, respectively…. The debt ratios of all four countries exceed the level of debt that harms economic growth. As an indication of this over-indebtedness, composite nominal GDP growth for these four countries remains subdued. The slowdown occurred in spite of numerous unprecedented monetary policy actions – quantitative easing, negative or near zero overnight rates, forward guidance and other untested techniques. Read it and think about this, gentle reader. We’re digging a great big hole that is likely to cave in on us before we manage to claw our way back out of it. We need to “wargame” how we respond in our personal lives. That is going to be a big focus of my letters in the coming months. Lacy’s firm, Hoisington Investment Management Company (www.Hoisingtonmgt.com), is a registered investment advisor specializing in fixed-income portfolios for large institutional clients. Located in Austin, Texas, the firm has over $5 billion under management and is the sub-advisor of the Wasatch-Hoisington US Treasury Fund (WHOSX). My days continue to be full of information downloads, phone calls, decisions. Probably not unlike yours. Am I the only one that feels that in a world where we have ever more tools that are supposed to simplify our lives, our lives are becoming more complex? Time seems to be a dwindling resource. But I really can’t complain because it’s a fascinating complexity to explore. I have roughly 120 people, sorted into various sized groups, doing research on nearly two dozen topics dealing with the future that we will cover in the new book. The groups are beginning to get their research and outlines for the chapters back to me, and overall I’m quite impressed with what I’m reading. We’re talking about 1000+ pages of dense research and links to other articles. As I was thinking about the design of particular chapters and assigning groups to research them, I had a general idea of the direction in which things would go. More often than not, though, I had little idea of the complexity (there is that word again) and the scope of information that the research on each topic would reveal. It is truly a mind-expanding experience to try to get your head around how the world will change in the next 20 years. I glibly say in speeches that the world is going to change more and faster in the next 20 years than it did in the last 100 years; but when you begin to contemplate the dozens of different areas in which change is going to happen – and not just the technological but the sociological and geopolitical implications of the change – and then, on top of all that, try to think about how all that will impact our investments, it becomes a bit daunting. Don Quixote comes to mind as I face this task. But I’m going full tilt at the windmill anyway. I hope you’re having a great week, too. The striking aspect of the U.S. economy’s 2015 performance was weaker economic growth coinciding with a massive advance in nonfinancial debt. Nominal GDP, the broadest and most reliable indicator of economic performance, rose $549 billion in 2015 while U.S. nonfinancial debt surged $1.912 trillion. Accordingly, nonfinancial debt rose 3.5 times faster than GDP last year. This means that we can expect continued subpar growth for the U.S. economy. 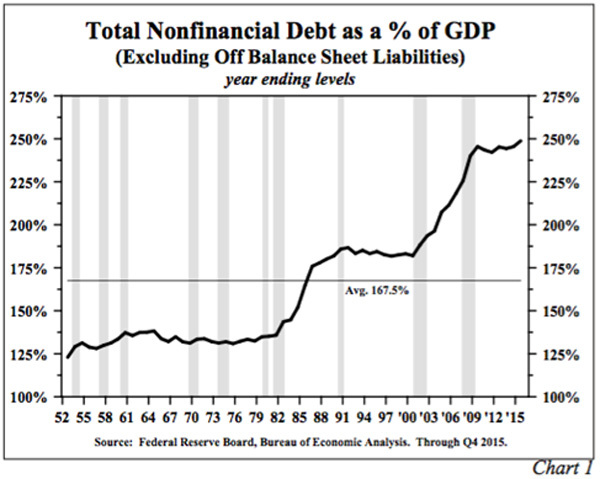 The ratio of nonfinancial debt-to-GDP rose to a record year-end level of 248.6%, up from the previous record set in 2009 of 245.5%, and well above the average of 167.5% since the series’ origination in 1952 (Chart 1). During the four and a half decades prior to 2000, it took about $1.70 of debt to generate $1.00 of GDP. Since 2000, however, when the nonfinancial debt-to-GDP ratio reached deleterious levels, it has taken on average, $3.30 of debt to generate $1.00 of GDP. This suggests that the type and efficiency of the new debt is increasingly non-productive. Most significant for future growth, however, is that the additional layer of debt in 2015 is a liability going forward since debt is always a shift from future spending to the present. The negative impact, historically, has occurred more swiftly and more seriously as economies became extremely over-indebted. Thus, while the debt helped to prop up economic growth in 2015, this small plus will be turned into a longer-lasting negative that will diminish any benefit from last year’s debt bulge. Nonfinancial debt consists of the following: a) household debt, b) business debt, c) federal debt and d) state and local government debt. Household debt, excluding off balance sheet liabilities, was 78.3% of GDP at year-end 2015, more than 20 percentage points above the average since 1952. However, this ratio has declined each year since the 2008-09 recession. Credit standards were lowered considerably for households in 2015 making it easier to obtain funds. Delinquencies in household debt moved higher even as financial institutions continued to offer aggressive terms to consumers, implying falling credit standards. Furthermore, the New York Fed said subprime auto loans reached the greatest percentage of total auto loans in ten years. Moreover, they indicated that the delinquency rate rose significantly. Fitch Ratings reported that the 60+ day delinquencies for subprime auto asset-backed securities jumped to over 5%, the highest level since 1996. Prime and subprime auto delinquencies are likely to move even higher. According to the Fed, 34% of auto sales last year were funded by 72-month loans. With used car prices falling on an annual basis, J.D. Power indicates that the negative equity on auto loans will hit a ten-year high of 31.4% this year. Despite the lowering of credit standards, the ratio of household debt-to-GDP did decline in 2015, primarily due to mortgage repayments. However, the apparent decline in household debt is somewhat misleading because it excludes leases. The Fed website acknowledges the deficiency of excluding leases by pointing out that personal consumption expenditures (PCE), compiled by the Bureau of Economic Analysis (BEA), do include leases. With leases included, the change in consumer obligations can be inferred by using the personal saving rate (PSR), which is household disposable income minus total spending (PCE). If the PSR rises (i.e. spending is growing more slowly than income) debt is repaid or not incurred. Indeed from 2008 to 2012 the PSR rose from 4.9% to 7.6%. However, since 2012, the saving rate has declined to 5.0% (at year-end 2015), implying a significant increase in debt obligations. The consumer did, in fact, increase borrowing last year by $342 billion even though the household debt as a percent of GDP declined. The household debt-to-GDP ratio dropped from 82.0% in 2012 to 78.3% in 2015; however, excluding mortgages consumers have actually become more leveraged over the past three years with non-mortgage debt rising from 17.9% to 19.5% of GDP. Last year business debt, excluding off balance sheet liabilities, rose $793 billion, while total gross private domestic investment (which includes fixed and inventory investment) rose only $93 billion. Thus, by inference this debt increase went into share buybacks, dividend increases and other financial endeavors, albeit corporate cash flow declined by $224 billion. When business debt is allocated to financial operations, it does not generate an income stream to meet interest and repayment requirements. Such a usage of debt does not support economic growth, employment, higher paying jobs or productivity growth. Thus, the economy is likely to be weakened by the increase of business debt over the past five years (Chart 2). In 2015 the ratio of business debt-to-GDP advanced two percentage points to 70.4%, far above the historical average of 51.7%. Only once in the past 63 years has this ratio been higher than in 2015. That year was 2008, when the denominator of the ratio (GDP) fell sharply during the recession. Importantly, the ratio advanced over the past five years just as it did in the years leading up to the start of the 2008-09 recession, and the 2015 ratio was 3% higher than immediately prior to 2008. The rise in the debt ratio is even more striking when compared to after-tax adjusted corporate profits, which slumped $242.8 billion in 2015. The 15% fall in profits pushed the level of profits to the lowest point since the first quarter of 2011 (Chart 3). 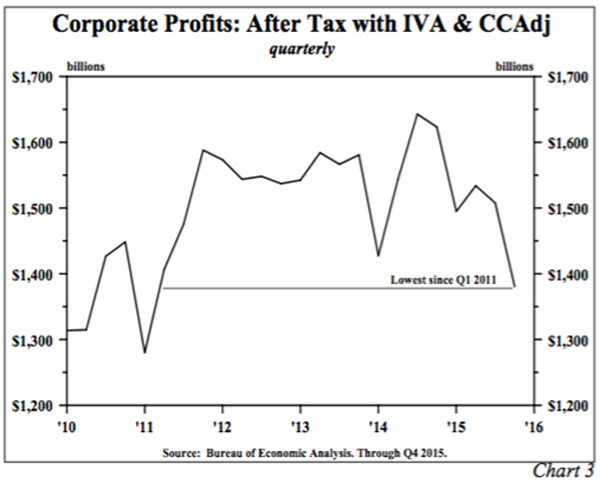 In the past eight quarters profits fell 6.6%, the steepest drop since the 2008-09 recession. 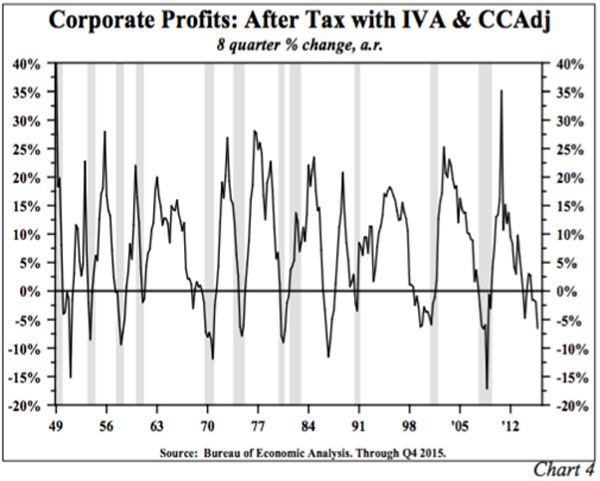 On only one occasion since 1948 did a significant eight quarter profit contraction not precede a recession (Chart 4). The jump in corporate debt, combined with falling profits and rising difficulties in meeting existing debt obligations, indicates that capital budgets, hiring plans and inventory investment will be scaled back in 2016 and possibly even longer. Indeed, various indicators already confirm that this process is underway. Core orders for capital goods fell sharply over the first two months of this year. Surveys conducted by both the Business Roundtable and The Fuqua School of Business at Duke University indicate that plans for both capital spending and hiring will be reduced in 2016. U.S. government gross debt, excluding off balance sheet items, reached $18.9 trillion at year-end 2015, an amount equal to 104% of GDP, up from 103% in 2014 and considerably above the 63-year average of 55.2% (Chart 5). U.S. government gross debt, excluding off balance sheet items, gained $780.7 billion in 2015 or about $230 billion more than the rise in GDP. The jump in gross U.S. debt is bigger than the budget deficit of $478 billion because a large number of spending items have been shifted off the federal budget. The divergence between the budget deficit and debt in 2015 is a portent of things to come. This subject is directly addressed in the 2012 book The Clash of Generations, published by MIT Press, authored by Laurence Kotlikoff and Scott Burns. They calculate that on a net present value basis the U.S. government faces liabilities for Social Security and other entitlement programs that exceed the funds in the various trust funds by $60 trillion. This sum is more than three times greater than the current level of GDP. The Kotlikoff and Burns figures are derived from a highly regarded dynamic generational accounting framework developed by Dr. Kotlikoff. They substantiate that, although these liabilities are not on the balance sheet, they are very real and will have a significant impact on future years’ budget deliberations. According to the Congressional Budget Office, over the next 11 years federal debt will rise to $30 trillion, an increase of about $10 trillion from the January 2016 level, due to long understood commitments made under Social Security, Medicare and the Affordable Care Act. Any kind of recession in this time frame will boost federal debt even more. The government can certainly borrow to meet these needs, but as more than a dozen serious studies indicate this will drain U.S. economic growth as federal debt moves increasingly beyond its detrimental impact point of approximately 90% of GDP. The above federal debt figures do not include $2.98 trillion of state and local debt. State and local governments also face adverse demographics that will drain underfunded pension plans. Already problems have become apparent in the cities of Chicago, Philadelphia and Houston as well as in the states of Illinois, Pennsylvania and Connecticut; the rating agencies have downgraded their respective debt rankings significantly over the past year. More problems will surface over the next several years. The state and local governments do not have the borrowing capacity of the federal government. Hence, pension obligations will need to be covered at least partially by increased taxes, cuts in pension benefits or reductions in other expenditures. Total debt, which includes nonfinancial (discussed above), financial and foreign debt, increased by $1.968 trillion last year. This is $1.4 trillion more than the gain in nominal GDP. The ratio of total debt-to-GDP closed the year at 370%, well above the 250-300% level at which academic studies suggest debt begins to slow economic activity. The Federal Reserve, the European Central Bank, the Bank of Japan and the People’s Bank of China have been unable to gain traction with their monetary policies. This is evident in the growth of nominal GDP and its two fundamental determinants – money and velocity. The common element impairing the actions of these four central banks is extreme over-indebtedness of their respective economies. Excluding off balance sheet liabilities, at year-end the ratio of total public and private debt relative to GDP stood at 350%, 370%, 457% and 615%, for China, the United States, the Eurocurrency zone, and Japan, respectively. The debt ratios of all four countries exceed the level of debt that harms economic growth. As an indication of this over-indebtedness, composite nominal GDP growth for these four countries remains subdued. The slowdown occurred in spite of numerous unprecedented monetary policy actions – quantitative easing, negative or near zero overnight rates, forward guidance and other untested techniques. 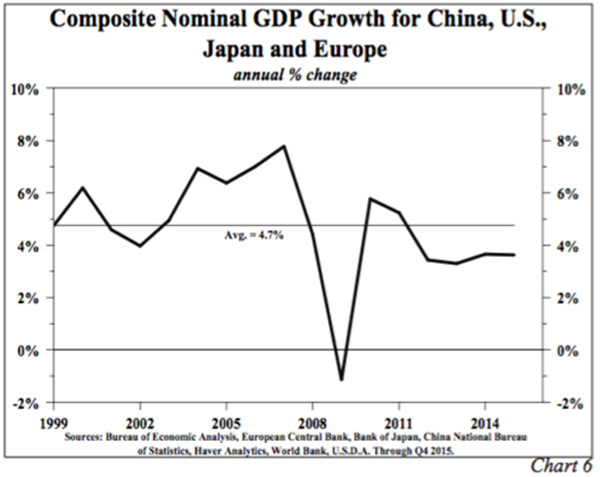 In 2015 the aggregate nominal GDP growth rose by 3.6%, sharply lower than the 5.8% growth in 2010 (Chart 6). The only year in which nominal GDP was materially worse than 2015 was the recession year of 2009. 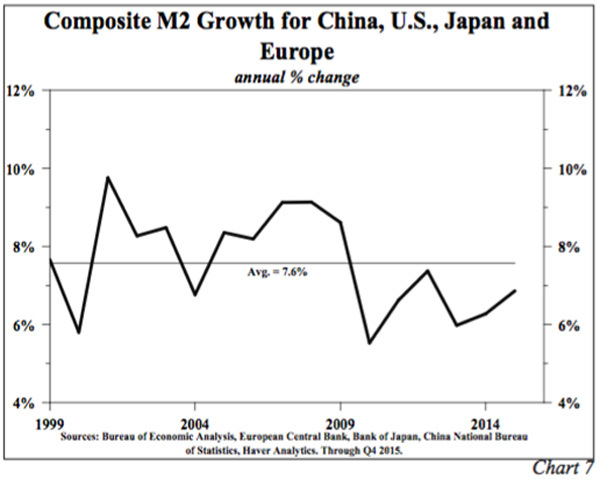 Since nominal GDP is equal to money (M2) times its turnover, or velocity (V), the present situation becomes even less rosy when examining the two critical variables M2 and V.
Utilizing M2 as the measure of money, the growth of M2 for China, the United States, the Eurozone and Japan combined was 6.9% in 2015, almost a percentage point below the average since 1999, the first year of available comparable statistics for all four (Chart 7). Historical experience shows that central banks lose control over money growth when debt is extremely high. Velocity, or the turnover of money in the economy (V=GDP/M2), constitutes a serious roadblock for central banks that are trying to implement policy actions to boost economic activity. Velocity has fallen dramatically for all four countries since 1998 (Chart 8). Functionally, many factors influence V, but the productivity of debt is the key. Money and debt are created simultaneously. If the debt produces a sustaining income stream to repay principal and interest, then velocity will rise since GDP will eventually increase by more than the initial borrowing. If the debt is a mixture of unproductive or counterproductive debt, then V will fall. Financing consumption does not generate new funds to meet servicing obligations. Thus, falling money growth and velocity are both symptoms of extreme over-indebtedness and non-productive debt. 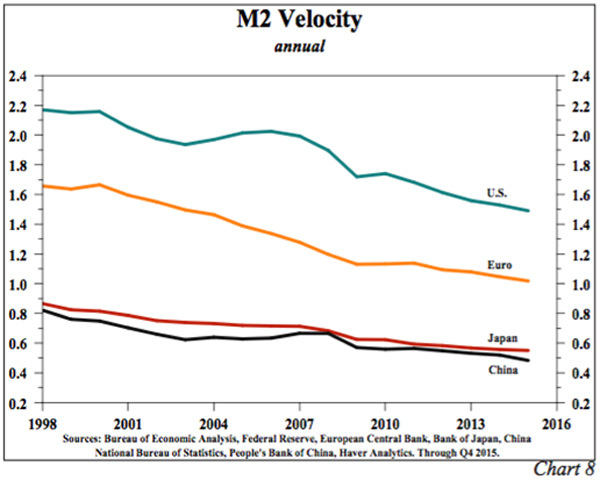 Velocity is below historical norms in all four major economic powers. U.S. velocity is higher than European velocity that, in turn, is higher than Japanese velocity. This pattern is entirely consistent since Japan is more highly indebted than Europe, which is more indebted than the United States. Chinese velocity is slightly below velocity in Japan. This is not consistent with the debt patterns since, based on the reported figures, China is less indebted than Japan. This discrepancy suggests that Chinese figures for economic growth are overstated, an argument made by major scholars on China’s economy. Our economic view for 2016 remains unchanged. The composition of last year’s debt gain indicates that velocity will decline more sharply in 2016 than 2015. The modest Fed tightening is a slight negative for both M2 growth and velocity. Additionally, velocity appears to have dropped even faster in the first quarter of 2016 than in the fourth quarter of 2015. Thus, nominal GDP growth should slow to a 2.3% - 2.8% range for the year. The slower pace in nominal GDP would continue the 2014-15 pattern, when the rate of rise in nominal GDP decelerated from 3.9% to 3.1%. Such slow top line growth suggests that spurts in inflation will simply reduce real GDP growth and thus be transitory in nature. Accordingly, the prospects for the Treasury bond market remain bright for patient investors who operate with a multi-year investment horizon. As we have written many times, numerous factors can cause intermittent increases in yields, but the domestic and global economic environments remain too weak for yields to remain elevated. MANY workers depend on their employers for their retirement income. 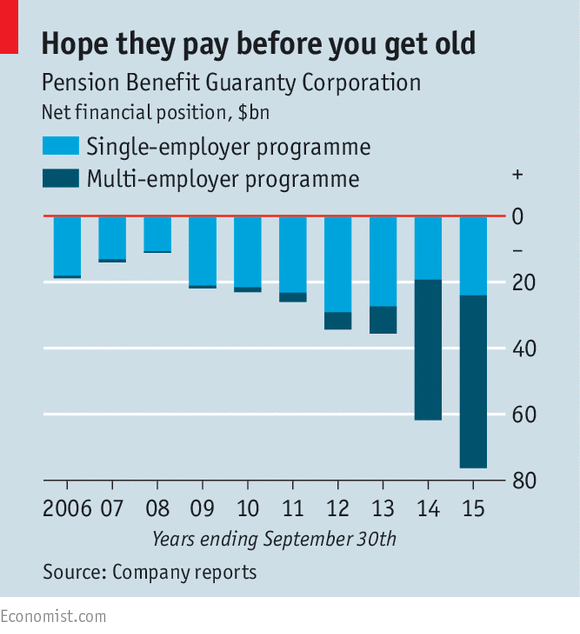 But, for defined-benefit schemes, this is an explicit bet that their employer will still be around several decades later: quite a gamble. So governments in Britain and America have set up insurance schemes designed to protect workers against the risk that their companies go bust. These bodies, Britain’s Pension Protection Fund (PPF) and America’s Pension Benefit Guaranty Corporation (PBGC), are funded by levies on employers. Now that Tata Steel’s loss-making British operations are up for sale, the chances are that the company’s pension fund will end up in the PPF’s clutches before too long. Buyers are likely to cherry-pick the steel company’s assets, which may leave the scheme without a viable sponsor—contributions into the fund were £155m ($219m) in the most recent financial year. And because the scheme is a legacy of the old nationalised British Steel, it is huge, relative to the existing business: its assets are almost £14 billion compared with annual turnover of just £8.1 billion at Tata Steel’s European operations. Fortunately, the scheme is pretty well-funded, thanks to a policy of buying inflation-linked government bonds to match its liabilities closely. As of March 2015 it had a deficit of £485m (or 3% of assets). That would still be a lot for a private buyer to agree to fund. But it is not that big a burden for the PPF, which had a surplus of £3.6 billion at the time of its last report. Things don’t look quite as healthy over at the PBGC, which has been around for much longer. As of its 2015 report it had total assets of $87.7 billion and liabilities of $164 billion—a deficit of $76.3 billion, a record (see chart). The big problem is the multi-employer bit of the PBGC’s responsibilities, where the deficit is $52.3 billion. Multi-employer schemes cover industries such as mining and trucking, in which a number of companies contribute to a collective pot. As the industry shrinks and individual employers go bust, the financial position of such schemes deteriorates. They end up in the arms of the PBGC when they run out of money to pay benefits (normally, when a single company goes out of business, there are enough assets to cover most of the liabilities). So when a multi-employer failure occurs, the PBGC’s liability is accordingly huge. It makes provision on its balance-sheet for funds that it expects to run dry over the next decade. But Congress has provided for the PBGC to get a levy of only $27 per employee per year. That adds up to an annual payment of around $270m, woefully inadequate to cover a $52 billion liability. On March 31st the PBGC warned that it will require significantly higher premiums to keep its multi-employer scheme running. And last year it said, with respect to the scheme, that “the risk of insolvency rises over time, to exceed 50% in 2025.” It added that the risk increases to more than 90% within 20 years. “When the programme becomes insolvent, PBGC will be unable to provide financial assistance to pay guaranteed benefits in insolvent plans,” it concluded. The PPF is in a much stronger financial position because it has been better funded. But the fundamental problem for such insurance schemes is the changing nature of industry and of the type of pensions promised by employers. Defined-benefit promises, where the pension is linked to a worker’s final salary, are the most expensive for companies to fund. They were the norm in the 1960s and 1970s when developed economies had a much bigger focus on heavy (and unionised) industry. Those sectors have now shrunk in size but they still must bear the legacy cost of the pensions promised to former workers. British Steel’s pension fund has fewer than 17,000 working members but more than 86,000 claiming retirement benefits. Meanwhile, the businesses that have emerged in the past 20 years have tended to be non-unionised and to offer defined-contribution pensions, in which retirement income is not guaranteed by the employer. Such schemes are not part of the PGBC or the PPF; there is no promise for an insurance scheme to back. So there are no new companies to pay the levy; an ever-smaller number of employers are funding a huge historic liability. Congress needs to pull its finger out. The PBGC can hardly cut benefits any further: a worker with 30 years’ service in a multi-employer scheme will get less than $13,000 a year, with no inflation protection. If Congress doesn’t want to charge employers more, it should fund the PBGC directly. Setting up an insurance scheme, and then failing to fund it adequately, is a betrayal of its constituents. Virtually all new fossil fuel-burning power-generation capacity will end up “stranded”. This is the argument of a paper by academics at Oxford university. We have grown used to the idea that it will be impossible to burn a large portion of estimated reserves of fossil fuels if the likely rise in global mean temperatures is to be kept below 2C. But fuels are not the only assets that might be stranded. A similar logic can be applied to parts of the capital stock. February was the warmest month on record. The current El Niño — the warming of the global climate triggered by the Pacific Ocean — has boosted temperatures, just as it did in 1997-98. The recent supposed pause in rising temperature was relative to the sudden jump at that time. A comparison between 1998 and today shows temperature continues to climb, together with atmospheric stocks of carbon dioxide. This reminds us of the realities of climate change. Moreover, two forms of inertia govern climate policy. First, infrastructure in power generation, which generates a quarter of all anthropogenic emissions, is long-lived. In the EU, 29 per cent of thermal power plants are more than 30 years old and 61 per cent are more than 20 years old. Second, carbon dioxide remains in the atmosphere for centuries. Thus it is necessary to think not of annual flows but of cumulative emissions or of a global carbon budget. The Oxford paper assumes (optimistically) that emissions from all other sectors proceed in accordance with the emissions pathway judged by the Intergovernmental Panel on Climate Change to give a 50 per cent chance of keeping the temperature increase below 2C. It assumes, as well, that new generating plants are operated to the end of their normal economic lives. Under those assumptions, capital stock created after 2017 would break the global carbon budget. Yet, in the past decade alone, the emissions implied by the investment in power generation have been rising at 4 per cent a year. To shift suddenly to zero emissions would appear inconceivable. Accelerated falls in emissions from other activities would alleviate the pressing nature of this dilemma, but only modestly. Worse, the reliance on fossil fuels of transport will be harder to cut sharply than that of power generation. Indeed, decarbonisation of the latter is the most effective way to decarbonise tran­sport, by means of rapid spread of electric vehicles. Within power generation itself, there are four options. The first would be a more or less immediate shift to zero-emissions technologies. The second would be retrofitting of conventional capacity with carbon capture and storage. The third would be to replace new capital stock with zero-emissions capacity early in its life. The last would be early introduction of technologies to remove atmospheric stocks of carbon. Zero-carbon energy includes renewables, biomass, hydroelectricity and nuclear power. Costs of renewables are falling rapidly. Challenges remain, notably grid integration and storage. The question is now more “when” than “whether”. It is not going to be next year — not even if assisted by an accelerating rise in energy efficiency. Again, some form of carbon capture and storage seems a vital part of any solution. But these technologies remain largely untried and expensive. That is one reason why a rapid shift in investment patterns appears crucial. The option of proceeding with investment in a conventional plant only to scrap it early would be wasteful and in­effective. Cutting the average life of generating plants by a decade would delay the “commitment year” — after which we would have to scrap additional installed capacity before it reached the end of its normal economic life — to no later than 2023. This leaves little time to transform the world’s investment path. It would seem wiser to install zero-emissions capacity faster now instead. That is likely to be particularly beneficial because the costs are falling with cumulative production. In the last resort, carbon removal or other forms of geoengineering might be employed. Yet all such technologies create technical, and even geopolitical, risks. If, for example, a country unilaterally intervened directly in the climate, the consequences for global relations would be unsettling or catastrophic. Far from having years to work out how to curb the risks of climate change, we face an imminent moment of truth. This also raises urgent policy questions. If carbon pricing were to deliver the desired shifts in investment, it would require credible commitment over the long term. But commitments for the long term can barely be credible. A novel approach would be imposition of cumulative caps on national emissions. Alas, their credibility would be low even if they could be agreed at all. An alternative might be licensing of new and existing power plants, to force shifts in technology and accelerate closure of carbon-emitting capacity. But such licensing would again have to be imposed quickly: otherwise, a race to build soon-to-be grandfathered conventional capacity would ensue. It would also be possible either to subsidise or to tax specific technologies. But this will be vulnerable to capture by existing or newly created vested interests. Finally, it is highly desirable to invest in research and development. It is a long-time scandal how little is invested in such R&D relative to subsidies to fossil fuels by governments. After last year’s Paris climate conference, the world congratulated itself on having agreed a new process, even though real action was postponed. Yet, given the longevity of a large part of the capital stock, the time for decisive change is right now, not decades in future. But the world is not really serious about climate, is it? It prefers fiddling while the planet burns. IN THE final year of the Obama administration its relationship with big business, always testy, is deteriorating into outright combat. 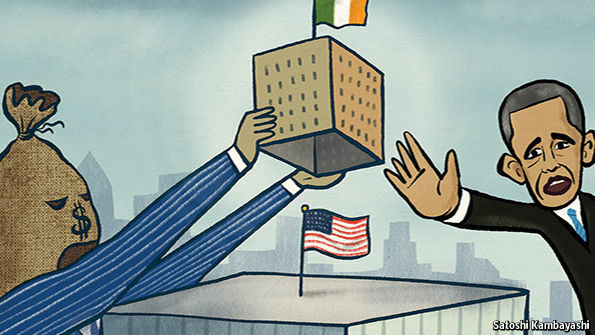 On April 4th Jack Lew, the treasury secretary, announced a renewed crackdown on “inversions”, takeovers that allow American firms to switch their nationality to that of the firm they are buying, in order to escape America’s tax net. Two days later Pfizer, a pharmaceutical firm, cancelled its $160 billion purchase of Allergan. 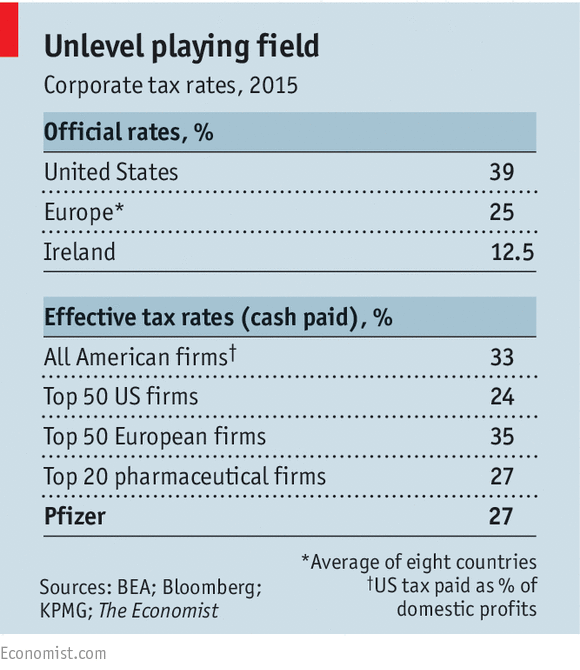 It would have been the third-biggest takeover in history and was premised on shifting Pfizer’s tax-domicile to Dublin. Howls of outrage were heard from America’s boardrooms and from Allergan investors, who lost $13 billion in 48 hours as its shares sank. European multinationals panicked that they might become the injured bystanders in an American brawl. The spat makes everyone look bad. It reveals an administration that is capricious and a Republican Party establishment so out of touch that it thinks it should be the mouthpiece for firms that renounce their citizenship. It shows great companies, such as Pfizer, reduced to shifty deal-junkies that are obsessed with financial fixes. It exposes a tax system that is 30 years out of date and obsolete in an age of globalisation. And it highlights a hyper-partisan political system that is incapable of reform—even though, in this case, almost everyone privately agrees what must be done. The backdrop is that America’s headline corporate-tax rate is far too high. It stands at 39%. That is roughly the same as it was in the late 1980s, but since then other rich countries have slashed their tax rates, to an average of 25%. At the same time big American firms have become more global. Financial markets have become more sophisticated. And the tax code has become far more complex, reaching 4m words. It is a golden arbitrage opportunity—one that big American firms have become brilliant at exploiting, pushing their bills far below the official rate. The actual tax paid by all corporations was 33% of their domestic pre-tax profits in 2015 (see table). The 50 largest listed firms in America paid global cash tax equivalent to just 24% of their pre-tax profits in 2015. Apple paid a rate of just 18% and Pfizer 27%. Despite having a notionally tougher tax regime, American firms got clobbered far less than their European cousins—the biggest 50 of which paid 35% of their global profits in tax. How do big American firms manage it? After all, their taxman claims a right to grab a share of their global profits, unlike most European authorities, which aim to tax only the local profits of global firms. Partly by exploiting myriad loopholes: there is a reason why America Inc spends $3 billion a year lobbying politicians. But crafty global tax-planning is vital, too. Firms shift where they book profits to countries with lower tax rates, and hope that the American tax authorities do not make up the difference. They allocate debt and its associated interest costs to their American subsidiaries, reducing profits there and boosting them elsewhere. They decline to repatriate foreign profits back to America (these are taxed only when they cross the border). At the end of 2015 the accumulated profits of big American firms stranded overseas reached an awe-inspiring $2 trillion. Apple has $92 billion parked abroad. Pfizer has $80 billion. Tax inversions are the logical culmination of all of these tactics—the ultimate expression of a system that doesn’t work. You buy a firm that is foreign and adopt its tax domicile, which will ideally be somewhere with rock-bottom rates. You book your global profits in that territory, which is especially easy if your firm specialises in intellectual property that has no physical presence, as pharmaceutical and technology firms tend to. Because the merged company is no longer American, it can access the trapped cash and pay it out as dividends and buy-backs to shareholders without incurring American tax. Since 2012 there have been 20-odd inversions. Allergan is itself the mutant product of two prior deals. The Treasury has tried to crack down before. This time its intervention will be decisive. The test for whether a firm qualifies will be tightened and companies that engage in serial inversions will be barred. The Treasury will also lean on firms that use intercompany loans to allocate debt to the American operations and depress their profits there. The number of pending inversions is small. Most sensible firms had already concluded they were pushing their luck. The odds of new inversions happening are negligible. The collateral damage may include foreign multinationals, which have $550 billion of net debt allocated to their American operations. Often this is legitimate and has nothing to do with tax. By matching their assets and liabilities in dollars foreigners can hedge against currency risks. It can make sense for them to tap America’s huge bond market. The Treasury’s new ruling on intercompany debt could prompt a giant and expensive rejig of foreign firms’ American balance-sheets. But the big loss is the chance to rewrite the tax code. The last time it happened was in the 1980s, when Ronald Reagan won cross-party support in Congress for comprehensive reform. The contours of a new settlement are obvious. Slash the headline rate to 25-30%, ditch all of the loopholes and charge American tax only on American profits. That would cut complexity, prod firms to bring profits home and keep tax revenues steady at about 2% of GDP. Sadly, as the primary campaign demonstrates, the corporate-tax system is not the only thing that has deteriorated. So has the quality of America’s political leaders and the effectiveness of its government. Tax reform will have to wait until after the election, in the hope that a more pragmatic president and Congress are in place. Don’t hold your breath. A militant form of laïcité has taken hold in France, backed by everyone from intellectuals to government officials. Is this what the republic’s founding fathers envisioned? By Robert ZaretskyRobert Zaretsky is a professor of history at the University of Houston's Honors College. His most recent book is Boswell's Enlightenment. Emblematic of this new tension was a series of battles over a simple strip of clothing. In 1989, a few Muslim girls were expelled from school when they refused to take off their hijabs, or headscarves, which the principal believed was an assault on the secular character of public schools. Shortly after, the French administrative court, the Conseil d’État, ordered them to be reinstated. But two years after 9/11, when similar incidents were repeated at other schools, the court reversed its original finding. While all “ostentatious” signs of religious faith — be they Jewish yarmulkes or Sikh turbans — were declared verboten in public schools, everyone knew that the principal target of the law was the hijab. It is a story that China has repeated since 2009. To offset falling export demand in the wake of the global financial crisis, the government unleashed an enormous wave of investment in railways, urban infrastructure, and property. The authorities could have used public expenditure to finance this construction boom, borrowing or printing the money required. Instead, officials opted for a bank credit boom, which caused the debt-to-GDP ratio to rise from around 150% in 2008 to 250% by 2014. In theory, bank-led resource allocation should have ensured that only viable projects were financed. In fact, much investment has been wasted: Huge new apartment blocks in some third-tier cities will never be occupied, and heavy-industry sectors such as steel and cement now suffer from severe overcapacity. With many firms in those sectors now relying on new loans to cover operating losses, large bad debts are inevitable. In fact, while states can be inefficient and prone to inflationary temptations, private banking systems can also allocate capital badly, sustaining credit cycles that leave behind profound economic malaise. The advanced economies and China together need to develop theories and policies which recognize that banks are different, and that the case for free-market competition – valid in other economic sectors – does not apply to them. If you are used to making visits to your bank to make your credit card payments, you may find this no longer an option in the future. Some banks are no longer accepting (or limiting their acceptance) of cash deposits. The war on cash forges on. Paper money, that is indeed more or less worthless, is slowly being taken out of circulation and being replaced by digital currency forms. 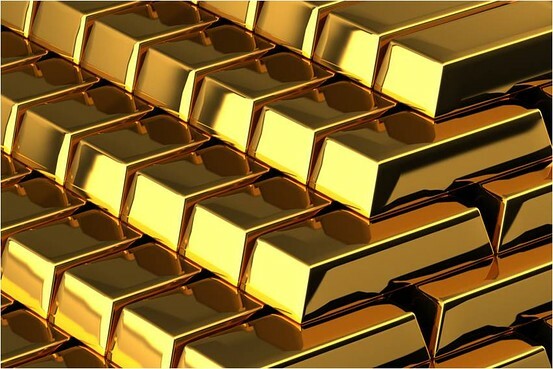 This shift presents of course the same fundamental problema as paper money itself: "digital money" is also not backed by gold or other precious metals or any asset representing real value. The whole concept of digitizing our transactions is being marketed as a convenience, a hassle-free payment method and a transparent, easy new way to smoothly run our lives and businesses, without the burden of carrying cash around. However, the realistic flip side of this joyful argument is more ominous than we might at first realize: Now, account monitoring or freezing, and confiscations will be easier than ever. And of course, by eliminating cash, central banks are getting rid of the last existing barrier to negative interest rates. This example clearly demonstrates that no announcement can be taken at face value. In fact, even though the Fed seemed determined to pursue tapering of its Quantitative Easing program, at the moment this seems increasingly unlikely. The current monetary policy belief, the naive notion that simply printing more and more money can fix the fundamental and structural problems of our economy, is so deeply entrenched in the minds of policy makers, advisors and politicians alike, that it is unlikely to change in the foreseeable future. According to Steen Jakobsen, the Federal Reserve is reaffirming its policy objective to maintain a weak dollar; the Fed cannot afford to let the dollar appreciate. "The WEAKER US dollar is the only policy tool which can help stabilize the world economy", he says. However, we do fail to see how this is possible in an economy so fatally overwhelmed with debt and paralyzed by low growth rates. New waves of interventionism, quick fixes and temporary band-aid solutions seem improbable cures for a global economy that has repeatedly proven to be simply unresponsive to such "treatments". As we explained in our last Outlook, the slowdown of the Chinese economy and the domino effect it may have on global markets is a major concern. On the one hand, there is the risk of the devaluation of the Chinese Yuan that will greatly affect international trade, and on the other hand, China exporting its deflation. It was these fears, that led central bankers worldwide to yet again pursue what they perceived as the less painful path, albeit only temporarily, by maintaining zero and negative interest rates - the latest Fed and ECB decisions confirm that. Central banks are once again turning to their two favorite market "fixing" tools: introducing fresh stimulus and forcing low interest rates - especially in tandem, they only serve to postpone, to prolong and to perpetuate the maladies of our economy. Although they hope to encourage slow economic growth and inflation, the solutions they are resorting to are not addressing the root causes of the problem, neither do they offer a single realistic plan to boost production and generate real output. The EU presents a fine example of the real-life implications of misdirected spending policies: consider the latest wave of government spending focused on housing for the incoming wave of migrants into the continent, a decision sold on humanitarian grounds, but also as a way to stimulate the meandering economic recovery. It might indeed be half true, by addressing the humanitarian and social problem of migrant housing (in the short term), but under no circumstances can it bear any real economic benefits for the area. The policy is not directed towards investments aimed at lifting overall production levels, it provides no long-term structural economic incentives and just like all the stimulus packages that came before it, and will undoubtedly come after it, it only employs wishful thinking to postpone the inevitable. In the very same vein, common sense begs the question: how could drowning interest rates in negative territory ever help speed up the growth rates? It is no wonder that people are losing faith in central bankers and the financial system as a whole. Who is to entrust their life savings to a system that is on a mission to strip them of any real value? The only beneficiaries from negative interest rates are debt-ridden governments adopting desperate measures in desperate times (Japan is the world's most indebted nation with a 246% debt to GDP ratio), as well as the big institutional and private debtors. Another interesting and more specific example that justifies this "crisis of faith" in government was presented by Prof. Thorsten Polleit, who argues there is another covert reason behind the Fed's decision: student loans. In the U.S., federal loans to students have grown by a staggering 818% since the global financial crisis, and this number does not even include the private loans to students. A quick look at a recent report from the Bureau of the Fiscal Service, a division of the U.S. Treasury, reveals that out of the USD 3.2 trillion in government assets, comprised mostly of net loans receivable (USD 1.2 trillion), the Federal Direct Student Loan Program accounted for USD 880.6 billion (72.4 percent) of total net loans receivable. Bearing in mind the old "qui bono" credibility test, perhaps it becomes increasingly clear that the Fed stands to gain from the growing debt bubble of its own making. It also becomes clear that the political implications of this strategy, as well the severe social consequences of financially subjugating the younger generation and saddling them with debt for life, strongly stress the need for our governments to reevaluate their priorities and duties to their people. "The central banks aren't interested in what works, they're interested in their own prestige. And they are so deep into it already and it didn't work. They will increase the medicine," said renowned financier Marc Faber and the publisher of The Gloom, Boom & Doom Report. "Eventually, they'll buy all the government bonds; they'll buy all the corporate bonds, all the shares outstanding. Afterwards the housing market goes down, they'll buy all the homes and then the government will own everything," he added. This policy is clear in the chart below - through its Quantitative Easing policy over the past nine years, the Fed has mushroomed its assets from less than USD1 trillion in 2007 to more than USD4 trillion. What we know is that the market is observing and waiting, for the next hike that was promised but still remains to be seen. Prof. Thorsten Polleit made an interesting analogy of this "waiting game" with Samuel Beckett's play "Waiting for Godot", in which the two leading characters spend the entirety of the play waiting for the arrival of a person named Godot. Although he never appears, they continue to hold on to the hope that he will eventually show up. Just like Beckett's characters, the public is continuously being promised a rate hike, which does not seem likely to happen. The longer the Fed's rate hikes are delayed, the less likely it is that they will actually happen. QE may well be under way once more; a rate cut is not off the table, particularly if the U.S. economic situation deteriorates once more, this would make rate hikes no longer a possible option. However, there is a point where the rationale of pilling on more stimulus programs will simply fail to convince the audience that these are viable solutions; it is most likely that we are already past that point and the public's trust in the "medicine" is so dramatically diminished that it wouldn't even work as a placebo.